Have you ever considered flying off for a destination wedding? For Americans, there are so many incredible options that are relatively close to home. There are a number of wedding destinations in Mexico and the Dominican Republic where you’ll find pristine beaches, forests and historical ruins, exactly the types of places where so many of us dream of getting married. Cancún is a town in the southeastern part of Mexico just north of the Riviera Playa, Mexico’s Caribbean coastline. It is an ideal location for those who dream of getting married with the sand beneath their feet, and the sight of the blue waves rolling in. With the help of local wedding planners, it’s very easy to get everything arranged without ever having to arrange a pre-wedding visit. Once the wedding is over, there will still be plenty to do in Cancún. Popular diving locations include the island of Cozumel, which is well-known for its Santa Rosa wall and the Colombia shallows with their beautiful coral formations. If you get the chance you should also check out some of the incredible ruins at sites such as Cobá and Muyil. Cobá used to be a town of 50,000 and now consists of various causeways and a number of pyramids, reminding us of the place’s importance in Mayan history. The Dominican Republic is another excellent place to get married, with its beautiful beaches, friendly locals and incredible scenery. There is nothing quite like pottering around Santo Domingo’s Zona Colonial which is filled with 16th and 17th century Spanish architecture. 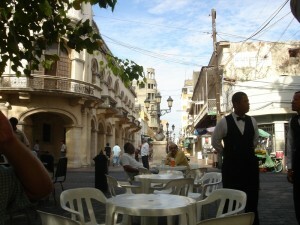 The Parque Colón is located in this quarter and across from it is one of the oldest New World churches. There’s also Playa Rinçon, one of the best Caribbean beaches, as well as Bahía de Las Águilas, famed for its yellow sands and bright blue sea. If you’re into nightlife, Santo Domingo is definitely the right place for you. The music floods out from the local bars and clubs onto the streets, creating a party atmosphere that so many people consider one of the hallmarks of the city. When it’s time to relax with your new partner, Santo Domingo is also a beautiful place to go for a stroll, stop for a coffee, and spend some romantic time alone. There are lots of amazing restaurants, so try to eat out as much as possible.